Its that special Friday again -- a FESTIVE FRIDAY! 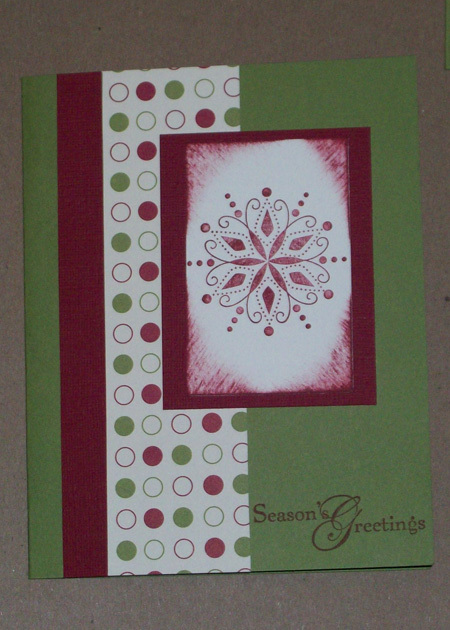 Festive Friday is a Blog Hop happening every other Friday, showcasing Christmas projects. 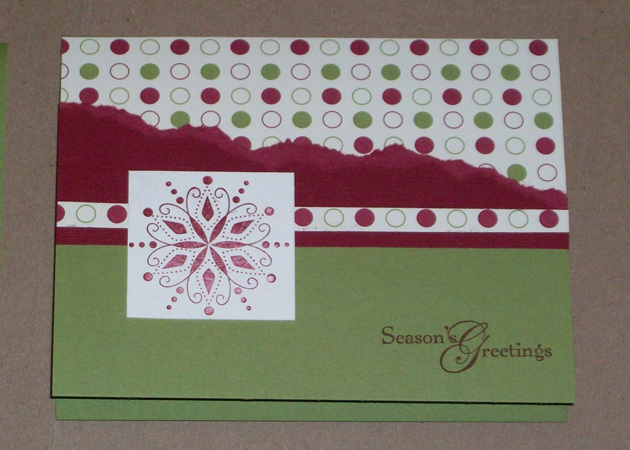 The goal is to work on a few Christmas Cards a month! If you're joining me directly, you will probably not want to miss the beginning of the hop over at Terris blog. If you've joined me from Brendas blog, You're hoppin' along just fine! A full list of blogs is at the end of this post. Please enjoy your tour of the festivities this week! I have to share with you today a One-Sheet wonderland... er, two sheet wonderland. Two sheets and card bases wonderland. Follows the layout principal of a One-sheet Wonder set of cards, but with a dash of contrast. Here are 8 simple card designs you can make from one sheet of designer paper, one sheet of coordinating card stock, and some simple card bases. You'd make two of each design - measure twice, cut once! Hah! - so from two 12x12 sheets, you can get 16 cards done. The embellishments can go from as plain-jane as mine, to blingapalooza depending on your taste or time constraints. One Sheet Wonder is a fabulous technique, economical and a time-saver. Excellent for large sets of cards, and depending on the stamps and embellishment, you can create a super matched theme set (Holidays, Birthday, Thank You, Announcements, Invitations) or a very widely varied group (emergency office stash, gift sets, fill up that card box). Preparing for the holiday card rush doesn't have to be a week-long frenzy of midnight crafting, join us twice a month as we stock up! See ya back here in two weeks for another Festive Friday! You're here at #8 (that's me - Angela :-) next you're off to see #9 Yolanda at http://craftyscentiments.blogspot.com/2011/04/festive-friday-blog-hop-week-8.html where she will amaze you with the Cricut Cuteness! I wish you all the best this Holiday weekend! Blessings to you and yours, and may your crafting be Happy! 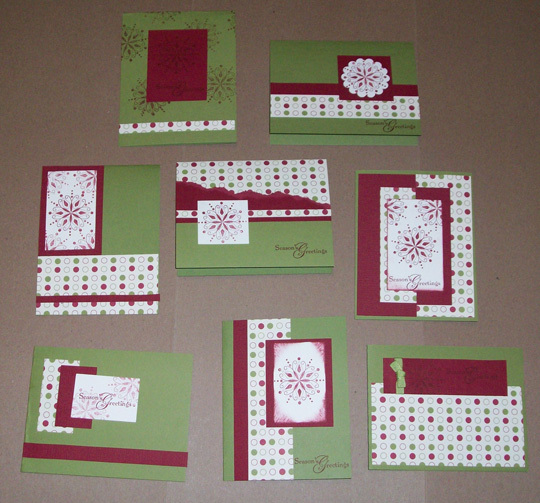 For these cards I used Cherry Cobbler 12x12 Textured Card Stock (#119610); Jolly Holiday Designer Series Paper (#117159); Old Olive 8.5 x 11 Card Stock﻿ (#100702); Cherry Cobbler Classic Stampin' Pad (#119669); and Snow Swirled stamp set (#111690). All card bases are 8.5 x 5.5" folded to 4.25 x 5.5". Oh Angela dont you just love OSW's. 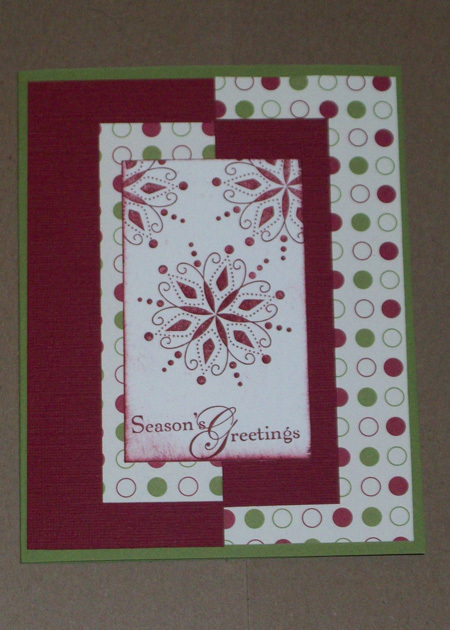 I love love the paper and your cards are just right... love it!!!!!! Love your cards. 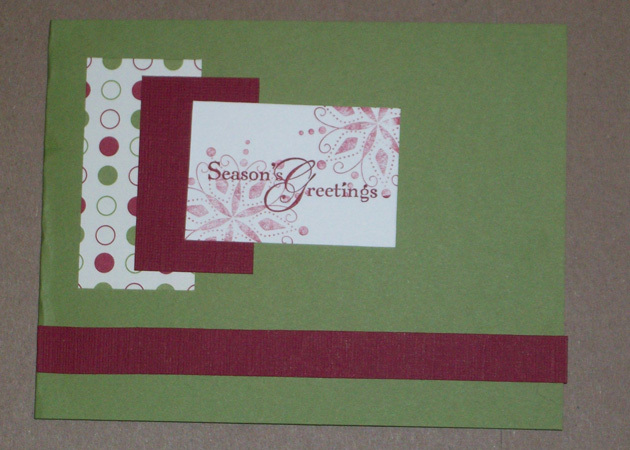 Like that you've created so many cards using cordinated paper. I love them all - great job! love them all. great group of cards. THANKS for sharing..
Wow you really hit the jackpot on this one! Love all the cards! Love the One Sheet Wonder (OSW) technique and your cards are fabulous. Thanks so much for sharing.